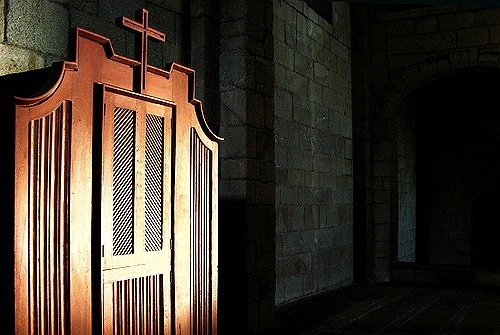 In a recent address to priests, Pope Francis exhorted priests to offer the Sacrament of Confession more frequently, to “open the doors of the Church” and “leave the light” of the confessional on longer. I have some misgivings (readers can see them on my own blog) about this Pontificate, but statements like these are what offers me hope. Indeed, I hope the Pope will write an encyclical on this stuff, because it is sorely needed. Modern Catholicism suffers from a crisis of the confessional, especially here in America. According to a study conducted by the Center for Applied Research in the Apostolate (CARA), Catholics hold the Sacrament of Confession in the lowest esteem. An eye-popping Seventy Five percent celebrate the Sacrament of Confession less than once a year. While there is often a trend in Catholicism for the younger generation to be more orthodox, the trend reverses when you talk about Confession. 50% of those before Vatican II found Confession very important. Amongst my generation, the number is 30%. Finally, frequent Mass attendance tends to lead to a greater respect for the Sacraments in general. This however is not true amongst confession. If you go to mass weekly, you are a percentage point more likely to say confession is important to you than someone who goes less than once a week. That’s what we call statistical noise. Some may wonder why any of this stuff even matters. Without the sacrament of confession, a lot of these other sacraments don’t matter. Church teaching is clear, you should not receive the sacraments (outside of baptism, confession, and the anointing of the Sick) in a state of mortal sin. Yet while so few place much importance on confession, many of them do partake in communion. Think of all the millenials engaged in cohabitation, yet receiving communion. How many advocate abortion yet are the first in line every Sunday? At best, these kinds of communions are worthless to the soul. At worst, they are beyond worthless, they are a sacrilege which compounds mortal sin on top of mortal sin. These gloomy numbers also matter because they make any lasting reform of the Church impossible. The great reforms of the Church throughout history have shown that it is the individual holiness of her members that causes the Church to flourish. Religious orders returned to spiritual prosperity once they stopped living like ordinary citizens of the world. The Church after the Council of Trent was able to launch the Counter Reformation only after several questionable practices by priests were outlawed. Finally, it will be impossible to bring people into the Church if we are not following the example we expect out of them. The Church places great importance on confession in her teachings. If we cannot abide by them, how do we expect the Protestant to, or worse, the non-Christian who is sincerely searching for God? While all of this looks bleak, there are some numbers that should give us hope. The more people celebrate the sacrament of confession, the more important it becomes to their faith life. While this might seem a pointless truism (of course it is more important if they celebrate it more often! ), Catholics need to understand why this is so. What is it about the sacrament that causes a very small percentage of the population to be nevertheless diehard in their devotion towards it? Furthermore, why are these statistically small individuals typically the strongest of Catholics by every measure? (Mass Attendance, frequency of receiving all sacraments, understanding of Church teaching, etc.) Why did future saints like Blessed John Paul II go to confession on a weekly basis, sometimes even more frequently? Why did Archbishop Fulton Sheen recall with delight how the nuns whose confessions he heard did not spare their venial sins in the confessional, even though Church law only requires the confession of mortal sins? As we prepare to examine this sacrament in greater detail, it is fitting we do so on the eve of the first Sunday after Easter, which Blessed John Paul II declared “Divine Mercy Sunday”, which celebrates the message of devotion to Christ’s Divine Mercy, which is heavily influenced by the Sacrament of Confession. To help us understand the sacrament better, we need to ponder anew the various parts, and what they signify. Let us think about all these things as we continue in our study over the next few weeks.